Arrow Video has done it again. Let me tell you they are on a roll lately with all the titles they have been dropping. And this is one of them that I have been looking forward to sitting down and watching. Hired to Kill! This is old school 90's action at its finest. 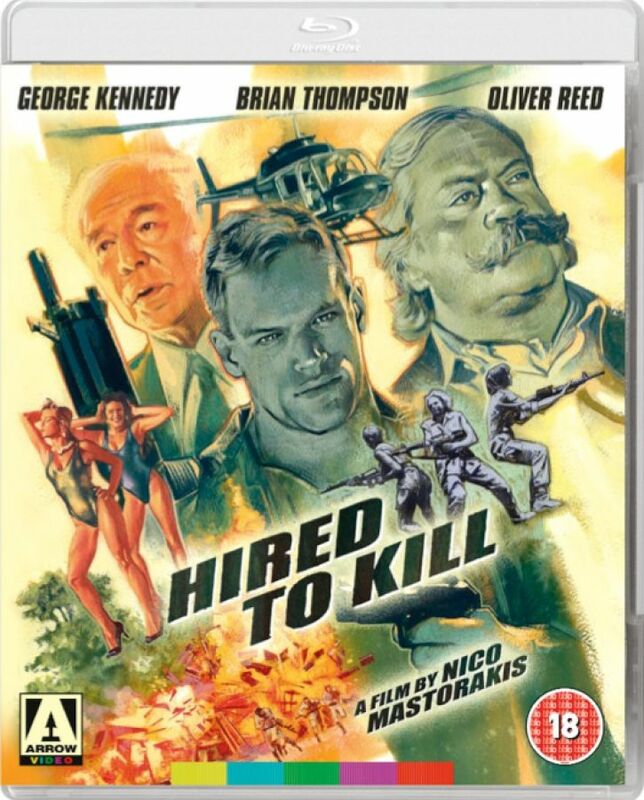 Hired to Kill features Brian Thompson from Cobra fame as Frank Ryan, a mercenary hired by the late George Kennedy to go down to the county of Cypra to rescue a political prisoner. We know Thompson is cool because in the opening scene when his alarm clock goes off he shoots it. As the evil leader, so to speak, of Cypra has lots of goons, and one fine fake mustache Thompson needs an elite commando squad to help him. That squad comes in the form of seven lethal lady's. See Thompson's cover is that of a gay fashion designer, and as this is the 90's it has some fine un-pc comments. He finds all his lady's and then we go into a nice training montage. From there its off to Cyrpus where the team meets there contacts and the evil Oliver Reed as the head bad guy. It all culminates with a large commando style raid in the last act. The film itself is an old favorite of mine. If you have never seen it before I think you will really enjoy it. Its nice to see Thompson play the good guy for once, and the lady's are quite beautiful. The action is over the top as is the dialogue and plot. As for the presentation Arrow has spared no expense. The transfer is gorgeous. From the bright popping opening credits, to the outside action scenes, everything in this transfer looks amazing. The sound is uncompressed stereo and sounds great even if you don't have a sound system. And the special features are all great. In fact this is what they are.